Hanson Logistics working in partnership with Calderdale College have been offering young adults aged between the ages of 16 and 25 an apprenticeship opportunity. One such apprentice is Jason Scholey who started at Hanson Logistics Ltd on the 13th of May 2013 within our busy Warehouse and Sample Despatch Centre. His first day was the same as any new start and he was taken through the site induction with our in-house trainer Simon Morelli. The purpose of the induction is to show Hanson’s commitment to Health and Safety for all employees and to understand site rules and regulations. Once inducted he was introduced to the Warehouse Manager Mr Les Ewart and his Assistant Manager Neil Mcaliskey and finally the warehouse team. Having met the team and a quick tour of the working area he was put with the Shift Supervisor (Ian Napthine) who assigned him various jobs within the warehouse over the coming weeks such as “Prepping” customer orders ready for despatch, and working with incoming loads confirming product deliveries. From there he moved into Hanson Repack and was involved with the repacking of Slug Pellets before finally moving into the Sample Despatch Centre where samples of products are taken and despatched worldwide. Jason showed he was versatile in any task given and excelled well showing great initiative and professionalism. 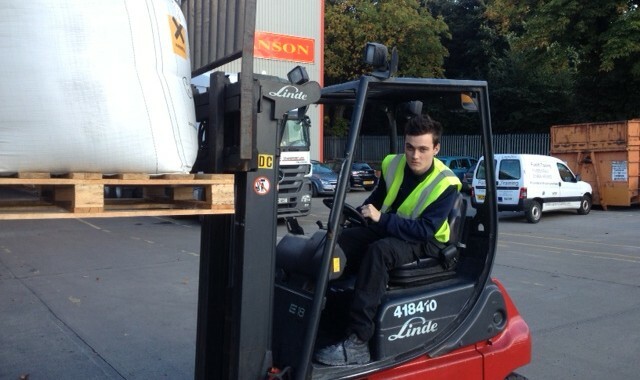 To aid Jason’s role within Hanson Logistic he was offered a 3 day, fork lift training course within Hanson’s own RTITB Accredited training centre where he received his Counter Balance truck license. Les Ewart, the Warehouse Manager has commented that Jason has worked very hard in the last 5 months and has shown great enthusiasm and integrity and long may it continue.